This spacious six bedroom, four and a half bathroom property will immediately make you feel like you are at your home away from home. Perfect for extended families, it features large living areas, a heated pool, and an enormous side yard, which is a rarity in Avalon. Located three blocks from the beach, it is also just a couple of blocks from Avalon’s lovely downtown area, with its restaurants, shops, and entertainment. The family room and living room both have HDTV’s. Enjoy a lovely view of the pool from the dining room which features seating for ten and a wine refrigerator. The kitchen counter adds seating for four more. A double oven and an additional refrigerator/freezer in the laundry room will make cooking and food preparation easier. The large laundry room extends to a mudroom that has a washer, dryer, utility sink and a half bathroom. 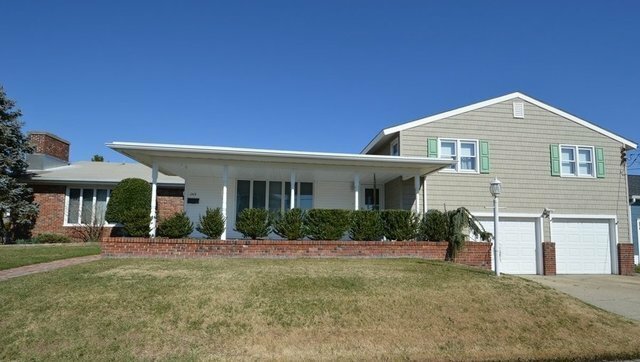 This split level home has four bedrooms upstairs. The first bedroom has a set of bunk beds and a single bed, while the second bedroom includes a double bed and a single. The third and fourth bedrooms share a full jack and jill bathroom with one bedroom featuring a queen-size bed and the other with a single bed. Two master bedrooms are located on the first floor. One of them has a king-size bed and close proximity to a bathroom with a shower and access to the pool area. A private bath with a tub and shower combination as well as a queen-size bed are featured in final bedroom. Return from the beach for a swim in the pool which has plenty of room for lounging, and an outside shower for convenience. The fenced in yard area has a swing set and plenty of room for outside play. A lovely front porch can be enjoyed in the evening while watching the sun go down. Off-street parking and a double garage with bikes, beach chairs, beach toys and a wagon are final conveniences.